When it come to transforming your body and getting lean, nutrition and personal training go hand-in-hand. You can't have one without the other... Yes it's possible to work hard in your Pure personal training sessions and achieve great results, but if you really want to change your body shape, improve your fitness levels and achieve a healthier lifestyle, then you really need to make changes to your diet. The results you will gain from making nutritional changes along with personal training sessions are transformational... that's when people really start to notice all the hard work and effort you've put in. So if you've made the investment in Pure Personal Training sessions then why not invest the same level of commitment into your diet. Would you like people to comment on how good you look in your new clothes, do you want to feel great, full of energy and have people notice these changes... then nutrition is key! Sorry to get all Gillian McKeith on you, but it's true, you need to think of food as fuel, if you gave your car the wrong fuel it wouldn't work properly and your body works in the same way. Eating the right foods, that don't come in a packet, box, jar or need a factory to remove the fat, will help you look and feel better. What we eat decides how we look and importantly how we feel... so we literally are what we eat! 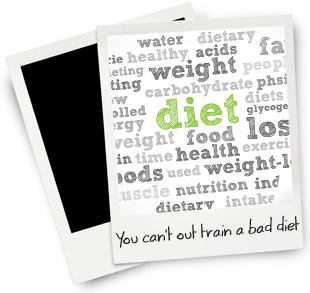 At Pure Personal Training we don't believe in faddy diets, we simply help you to eat in a healthier way. We'll give you advice so you can start making small changes to improve your health... Rome wasn't built in a day and neither will your new and improved body... there's no quick fix, it's about make simple, sustainable changes that you can embrace into your current lifestyle. And don't worry, It's not about restricting everything you enjoy, at Pure Personal Training we believe in the 80/20% rule. If you eat a balanced diet 80% of the time, then you can relax for 20% of the time. We will ask you to complete a regular food diary that we can monitor. From this we can give you the best advise on how to improve your current diet and change old habits, so you are on track to achieve your goals. Food shouldn't be complicated, there is a lot of conflicting information out there, but if you eat good quality, natural foods, which are unprocessed, you'll be on track to a leaner, healthier more energised body!